To sell your home faster and for top dollar in today’s market, home staging is one of the best marketing strategies. It puts your home in its best possible light and ensures that it has a strong first impression on a wide range of buyers. It is possible to stage your own home, but there are a few things to consider before committing to that decision. You may be hindering your home’s chances on the market rather than helping them. Here are some signs you would be better offer hiring a professional home stager to do the work. It’s difficult to look at the home you’ve lived in for years without having all of your memories and personal feelings attached to it. The thing is, when a home goes on the market, it’s like any other product. It’s important for it to appeal to a wide range of buyers. When we’re emotionally attached to our homes, it’s hard to see past what we love about it and look at it with a fresh, objective eye. A home stager bridges that gap. We look at home from the outside perspective of a buyer so we can see things as they will see it. We can then suggest the most effective changes that will put your home in its best light possible so it’s ready to make a great first impression when it hits the market. Staging a home takes a lot of time and energy. It includes researching the market, learning about your target buyer, assessing your home, making necessary repairs, decluttering, space planning, and adding the finishing touches. If you are already busy with work, kids, and other commitments, it may be hard to find time to do all that needs to be done to get the most out of the staging process. A professional home stager will relieve that burden so you can put all of your focus on the other important things in your life. We do all the research, assess your home, and then can carry out all of the tasks needed to make your home ready for the market. It’s one less thing for you to worry about. Home staging is all about appealing to the psychology of a home buyer. If you aren’t sure what that is (or haven’t even heard of it), then you’re not going to get the best results from your staging efforts. 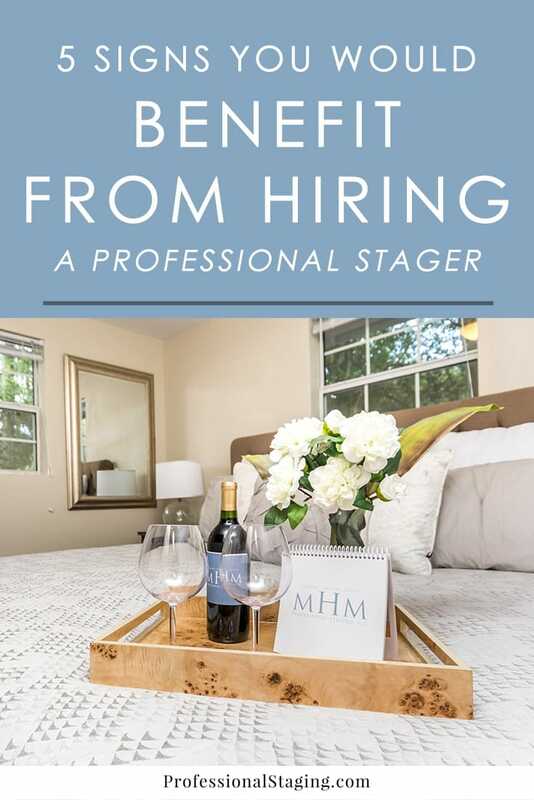 As professional home stagers, we have spent years researching and analyzing the buyer’s experience when they are house hunting. We know how to tap into their emotions and encourage them to feel at home when they tour a listing. It informs all of our decisions from the colors we pick to the way we arrange the furniture, as well as every small detail after that. The real estate market is constantly changing, and it’s different in every neighborhood. Knowing the real estate market in your area is key to staging your home effectively so that it appeals most to the buyers that will be considering it. The more you know about your target buyers, the more you can tailor your home to speak to them and evoke an emotional response. A number of elements come together to make a home appealing to buyers. The right staging can make a home feel larger, inviting, and highlight all its best attributes. Things like furniture arrangement, color schemes, vignettes, and other techniques are part of the staging process. If you don’t have a strong understanding of these techniques and how to use them effectively based on a home’s individual needs, then it’s best to leave it in the hands of a home stager to get the best possible results.